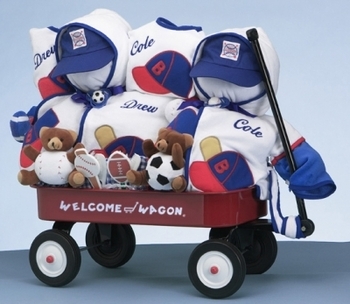 This large sports themed twins gift is perfect to celebrate the birth of twin baby boys! Mom and Dad will also appreciate the practicality of the baby necessities included! We've added two of everything except for the wagon itself! All of the layette items are are of premium quality and made in America of the finest cotton fabric! We can even personalize both bath robes & baby bibs with their names embroidered on each! Beautifully gift wrapped, you're sure to hit a home run with this creatively designed gift! Ships for free too. Note: the metal wagon seen in the item picture has been replaced with a larger all wooden red wagon. Please click on the More Images tab to see this new wagon design.